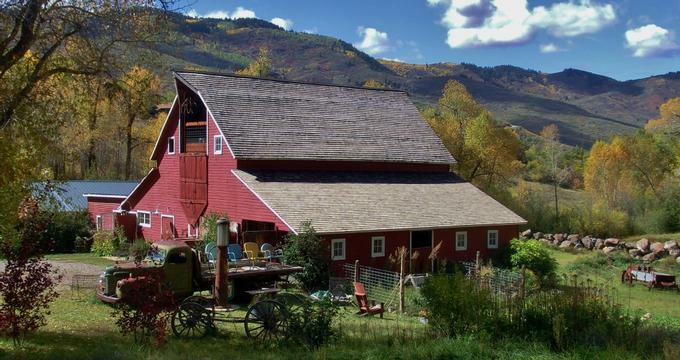 Located in a quiet valley just south of Glenwood Springs, Four Mile Creek Bed and Breakfast is a rustic bed-and-breakfast that offers an unforgettable mountain getaway. Formerly a homestead in 1885 and listed on the National Registry of Historic Places, the Four Mile Creek Bed and Breakfast features a variety of accommodations set in a historic barn, a comfortable lodge and rustic log cabins. All guest rooms and cottages are decorated in a relaxed, country style with wrought iron beds and plush linens, en-suite bathrooms with showers and baths, sitting areas and kitchens (cabins only), and porches with beautiful views. A complimentary breakfast is served in the ranch house dining room every morning, which also boasts a spacious living room with a massive stone fireplace, a sunroom and a lovely front porch with outdoor seating where guests can relax. Other amenities include an on-site gift shop and a network of hiking trails around the property. Four Mile Creek Bed and Breakfast features a variety of accommodations set in a historic barn, a comfortable lodge and rustic log cabins. All accommodations feature king or queen-size pillow-top beds dressed in high-quality linens, hypoallergenic comforters, and pillows, and en-suite bathrooms with showers and soaking tubs, single or double vanities, plush towel and bathrobes, and organic bath products. The Creekside Cabin is a charming and cozy, log cabin with a queen-size pillow-top bed dressed in high-quality linens, hypoallergenic comforters and pillows, an additional double futon bed, and en-suite bathroom with shower/bath combination, plush towel and bathrobes, and organic bath products. Set between Four Mile Creek and the big red barn, the Garden log cabin features two queen-size pillow-top beds dressed in high-quality linens, hypoallergenic comforters and pillows, a full bathroom with shower/bath combination, plush towel and bathrobes, and organic bath products, and a sitting area with a gas fireplace. A fully equipped kitchen has all the appliances and utensils needed for self-catering. Initially, the milking room of the historic red barn, the Red Barn Suite features a queen-size pillow-top bed dressed in high-quality linens, hypoallergenic comforters and pillows, and en-suite bathroom with an antique clawfoot tub, plush towel and bathrobes, and organic bath products. A fully equipped kitchen has all the appliances and utensils needed for self-catering. Located in the main house and named for the wrought iron blackbirds on the bed frame, the Black Bird Room features a queen-size pillow-top bed dressed in high-quality linens, hypoallergenic comforters and pillows, and en-suite bathroom with an antique clawfoot tub, plush towel and bathrobes, and organic bath products. A complimentary breakfast is served each morning and includes freshly brewed coffee and tea, fruit juices, fresh seasonal fruit, egg dishes, and daily selections such as baked oatmeal, croissants, blueberry muffins, homemade granola and Greek yogurt, and an assortment of fresh bread. A complimentary breakfast is served in the ranch house dining room every morning, which also boasts a spacious living room with a massive stone fireplace, a sunroom and a lovely front porch with outdoor seating where guests can relax. Other amenities include an on-site gift shop and a network of hiking trails around the property. Renowned for its hot springs, Glenwood Springs is a resort city in Colorado surrounded by the by the vast White River National Forest and the rugged Rocky Mountains. Glenwood Springs is packed with things to see and do, including Glenwood Canyon, which is abundant with wildlife and is home to Hanging Lake; the ancient underground caves of Glenwood Caverns, and the Glenwood Caverns Adventure Park overlooking the Colorado River.